The Three-Beam Magnetic Torpedo Laser Level is a very versatile product for Johnson and is designed to save the user time and money while delivering superior accuracy and durable quality. In the following review by Tom Hintz at NewMetalworker.com the benefits of owning this torpedo laser level are expressed while he states the different applications this level can be used for. For more information on this product please visit the 40-6184 product page or view the review below. To view this review in its original form click here. This kit includes the level itself, leveling stand, a nice soft-sided pouch and even the batteries! Laser levels are becoming commonplace in many types of workshops but there is nothing at all common about a torpedo level with a magnetic base that projects multiple beams. The Johnson Three-Beam Magnetic Torpedo Laser Level (#40-6184) gives the metalworker (many other fields as well) some new capabilities and accuracy that can make building projects faster without sacrificing precision. The Johnson Three-Beam Magnetic Torpedo Laser Level has the overall classic torpedo level profile but from there is gets very different than most. It is 9.527"-long by 2.205"-tall and 0.98"-thick. The body is machined from a tough grade of aluminum for superior accuracy and stability. The body appears to have been media blasted to give it a nice textured surface. The lower edge of the body has a V-groove and two sets of strong magnets that make working with metal structures very simple and essentially hands free. Once loaded with all of the internals theJohnson Three-Beam Magnetic Torpedo Laser Level still weighs a trim 1.653 lbs. This pair of horizontal bubble vials (left) make it easy to get the Johnson Three-Beam Magnetic Torpedo Laser Level in tune with the world so it projects its three dots perfectly. Though very close up you can still see the three laser dots (right) that give you lots of options during construction or installation of your projects. The electronics within the Johnson Three-Beam Magnetic Torpedo Laser Level are powered by three AA batteries that are supplied with the kit. Expected battery life with normal usage is about 50-hours. In addition to the Johnson Three-Beam Magnetic Torpedo Laser Levelitself you also get a leveling base, instruction manual and a soft-sided pouch. The Johnson Three-Beam Magnetic Torpedo Laser Level is fitted with four bubble vials that read plumb, level and a 45°-degree vial. The fourth is a cross-mounted vial that provides second level indicator 90-degrees to the long axis of the Johnson Three-Beam Magnetic Torpedo Laser Level. That combination of bubble vials lets you level the Johnson Three-Beam Magnetic Torpedo Laser Level precisely so that both the forward 90-degree left beams are true to the world. 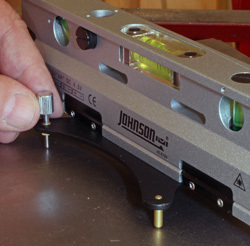 Both ends of the Johnson Three-Beam Magnetic Torpedo Laser Level body have vertical engraved sighting lines that make aligning this tool with a drawn layout line very accurate. 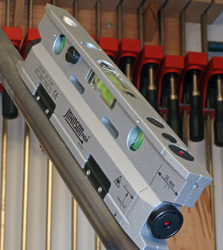 The bottom of the Johnson Three-Beam Magnetic Torpedo Laser Level body has a ¼"-20 thread that mates with virtually any camera-style tripod. The kit also includes a leveling base that attaches to that same ¼"-20 threaded boss. The base has one fixed leg and two adjustable ones that let you dial in the necessary corrections to get theJohnson Three-Beam Magnetic Torpedo Laser Level perfectly level on most surfaces. This base lets you adjust the Johnson Three-Beam Magnetic Torpedo Laser Level to shoot truly level lines forward, 90-degrees to the left and 90-degrees up from those two. 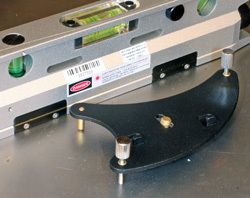 You get a choice (left) of the magnets built into the bottom edge of the Johnson Three-Beam Magnetic Torpedo Laser Level or the adjustable base (right) that comes with the kit. The Johnson Three-Beam Magnetic Torpedo Laser Level has three beams, 90-degrees apart. One emits straight out of the end of the body, one on the same plane as that but projecting 90-degrees to the left and the third that shoots straight up. All three beams come on when the pushbutton switch in the opposite end of the Johnson Three-Beam Magnetic Torpedo Laser Level is pushed. The beams have an indoor range of about 100-feet, dependent on the lighting conditions naturally. 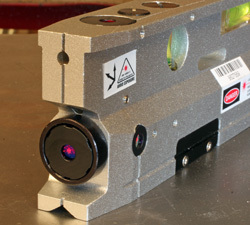 The Laser Wavelength (red) is 650nm +/-10nm and is rated as a Class IIIa beam with a maximum power output of <=5mW. The beams have an accuracy of +/-1/8"/50ft. 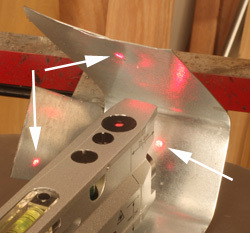 (+/-1mm/5m) The front and side beams are located ¾"-up from the bottom edge of the Johnson Three-Beam Magnetic Torpedo Laser Level. All three beams are 1" back from the front edge of the body. These simple dimensions mean that it will be very easy to place distant layout marks where you really want them. There is no big secret about using a common torpedo level but the Johnson Three-Beam Magnetic Torpedo Laser Level gives this age-old design even more capabilities. Being able to project three individual but highly precise references simultaneously from one surface can make many building or installation jobs much easier and way more accurate. The body of the Johnson Three-Beam Magnetic Torpedo Laser Level is nicely machined and finished (left) plus includes cut-in guidelines on each end that make it easy to align this level with layout lines. The magnets surrounding the bottom V-groove (right) make working with round stock easy. The easy to read bubble vials make leveling the Johnson Three-Beam Magnetic Torpedo Laser Level on most surfaces a simple task. From there you can laser your way through the rest of many projects with an accuracy that is very difficult to match with virtually any other tool and certainly not with traditional torpedo levels. The adjustable base is more important than you might think. Take any level and go around the shop or a room and see how many surfaces are truly level. Being able to dial in usually small but always-critical corrections at the Johnson Three-Beam Magnetic Torpedo Laser Level makes projecting level lines around the job very precise and surprisingly easy to do. The Johnson Three-Beam Magnetic Torpedo Laser Level is very durable from its heavy-duty aluminum body to the industrial tough fittings throughout. 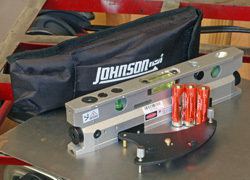 Johnson Level and Tool is sufficiently confident in the quality of this tool that they back it up with a 3-year warranty. The Johnson Three-Beam Magnetic Torpedo Laser Level can be a very useful tool for many metal and woodworkers as well as anyone that works around a home or business. The laser capabilities give this level wide-ranging capabilities that make it valuable in many building and installation projects. With a street price of about $119.00 (2-25-2011) for the kit shown in this review you can bring these capabilities to your shop or toolbox for less money than I had anticipated. With the obvious durability built into the Johnson Three-Beam Magnetic Torpedo Laser Level this should be a one- time purchase that will benefit your work for many years to come.